My wife and I started our online store back in 2007 and ever since our first year when we made 100K, we’ve been growing in the double and triple digits. But here’s the thing. With every passing year, we are finding it more and more difficult to maintain our double digit growth. Don’t get me wrong. Our store makes plenty of money and I’m really happy with where we are at. But there’s always a part of me that wants to grow it even more. In addition, I often feel pressure to show positive growth because of this blog:) I know it shouldn’t be that way but I do feel it. Anyway, my wife and I have been exploring various options for growing our ecommerce store. And in the grand scheme of things, there aren’t that many options to choose from. One, you can sell new and different products to open up new markets. In fact, this was one of the main reasons why we attended the Canton Fair this year after a long hiatus. Two, you can sell more to your existing customers which is why we’ve been focusing more efforts on email and content marketing this past year. Three, you can find new marketplaces and new customer bases that you haven’t tapped into yet. Should Everyone Sell On Amazon? Is Selling On Amazon Too Easy? But recently, my friends Lars and Kenric pushed me over the hump and finally convinced me to start listing our goods on Amazon and our results thus far have been pretty stellar. In our first week of listing just 3 products on Amazon, we sold over 60 units in a matter of 8 days which blew my mind! Here we were as a brand new seller, listing completely new products with 0 reviews, and our products sold like hot cakes! Here’s the best part. Did selling on Amazon cannibalize our regular online store sales? Not at all. In fact, our main online store grew around 25% in sales during the same period. In the grand scheme of things, Amazon is just another marketplace. Some people like to shop on Amazon and some people like to search for products online. And as I mentioned in my last post, the best way to future proof your shop and grow your sales is to sell your goods in as many different marketplaces as possible. Going forward, selling on Amazon will be a huge growth driver for our online store in the coming year. Thanks Lars and Kenric! So based on what I just told you, should you all just go out and start selling on Amazon? Not necessarily. And you DEFINITELY should never abandon your efforts on your own website! Amazon.com should be used as another channel for your business while you focus your efforts on building up a property that you own and control. Ultimately, your goal should be to establish a long term brand and use Amazon to further that goal. So with that in mind, your ability to be successful on Amazon will depend on your products and your margins. First off, if you are dropshipping or selling other people’s goods, selling on Amazon will eventually result in a race to the bottom in terms of pricing. When a lot of shopowners try to sell identical goods and fight for the buy box, the only real way you can compete is on price. Sure, there are some ways around this like creating special bundles for your goods or offering freebies with every purchase but in the long run, price will be your only leverage which never ends well. Therefore, if you are in a high competition niche with low margins and ZERO value add, Amazon is probably not the place for you. In fact, if you have ZERO value add, you probably shouldn’t be running your business in the first place. Because of the high selling fees that Amazon charges, you pretty much need to have high margins (at least >50% and preferably >66%) in order to be successful. 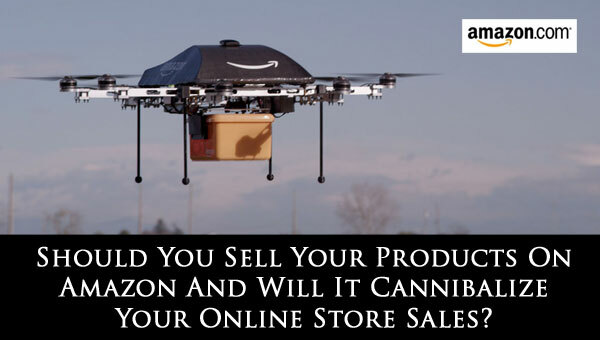 Therefore, the best way to take advantage of Amazon is by selling your own branded products. In fact, I would strongly argue that selling your own branded products is the best way to ensure that your online business has a long term future irrespective of Amazon. Either that or you must establish some sort of exclusive buyer relationship with your vendor that nets you an advantage. Is selling or creating your own branded products more difficult to do? Yes, it’s a little more work! But at some point, you have to ask yourself whether you want to create a long term sustainable business versus making a couple of extra bucks with straight arbitrage. My immediate success on Amazon made me excited and worried at the same time. When a brand new seller can get a simple listing up and make money right away, alarm bells usually start ringing in my head. Ever since I’ve been contemplating selling on Amazon, I’ve seen many new courses and strategies pop up on how to “game” the Amazon system. And I’m sure that these strategies do in fact work. But will they work in the long run? Probably not. I’ve been seeing a lot of junk listings on Amazon and they are already starting to crack down on crappy sellers. In fact, the Amazon of today kind of reminds me of EBay in 2005 when you could practically throw anything up and it would sell. In the long run, I’m willing to bet that Amazon will start shutting down entire categories and screen new sellers much more closely to make sure that they have legit businesses. And eventually, the market will become saturated with sellers for practically every type of product imaginable. Your main defense will be your brand. Amazon is evil. You must follow their rules and you have no control. But the fact is that lots of people shop there. So if you have your own branded products, should you be selling on Amazon? Hell yeah! In fact, selling on Amazon is a great way to start out whether it be to validate your niche or to make some sales until your own branded website kicks into high gear. I was skeptical at first but now I’m a believer. In fact, my experience with Amazon is one of the reasons why I will be putting together comprehensive Amazon tutorials for my online store course in the coming year. Bottom line? It is always in your best interests to have your own website and brand. But there’s lots of money to be made by taking advantage of the different marketplaces. While you are selling on Amazon, you should simultaneously be ramping up on SEO, CSE traffic, SEM and email marketing for your own website with the expectation that Amazon could ban you any day. Stop giving away all the secrets man! Ha. But seriously, thanks for the post. I’m getting ready to launch my own unique branded product on Amazon as an extension of my own e-commerce store in t-minus 24 days. I appreciate the backup confirmation that I’m headed in the right direction since it was partially a hunch on my part from one of your previous podcasts with the Yoga Mat guys. I love this post, perhaps because it resonates with my own beliefs. I started selling on Amazon in May of this year by sourcing products through retail stores’ sales. That SUCKED; it was a lot of work and I quickly experienced the “race to the bottom” syndrome. I’ve always loved the idea of creating my own products so I embarked on that and listed my fist product on Amazon in October. Ah…this is much better! 80% of my sales are my own products vs the inventory I have left from sourcing other stores. I recently purchased your course and I’m so excited to dig in and learn what I need to do to build an awesome and successful store. I’ll continue to sell on Amazon because I absolutely agree with you that it’s a marketplace you can’t ignore. Besides, it’s a great testing ground to validate products without having to spend a bundle to do it. I have been thinking about doing this, too, since reading your podcast with the yoga mat guy. I have my own brand. I make my own headbands. I signed up for Amazon about a month ago, but stopped when I realized my product photos weren’t appropriate for them (I need a totally white background.) I need to figure that out. I have SO many products, it’s kind of overwhelming. Anyway, I was wondering, do you do Fulfilled by Amazon, or do you ship on your own? I was thinking it might be nice to just have a small selection of products there and let them ship for me. What are your thoughts on this? We use fulfilled by Amazon because the allure of Amazon Prime will drastically increase your sales. How about the problem with returns? Unfortunately, there will be cases where a customer uses your product and makes a return resulting in a loss of money. But this is the cost of doing business. This is really interesting. I’d also say ‘focus on your own web site’, but you can actually establish a good brand on Amazon and this should help with your own store. Love your stories, they are VERY helpful! Thanks dojo. The Amazon marketplace is too large to ignore and they do allow you to register your brand. Well, I’ve been selling on Amazon since last year. I’ve had a few sales here and there. One thing I’ve discovered is competitors may buy your products just so that they can leave a bad review. I’ve had this happen to me twice. Luckily, I was able to have the feedback removed since Amazon FBA takes credit if there are fulfillment issues. I still don’t own my own business but it has always been an aspiration. So articles like this that give info on how to be successful are great. The interesting part is that landscape change so quickly now I wonder how relevant it will all be in the future. I’ve always thought about doing this, but was always intimidated or unsure of how to start. I think in the beginning it would be difficult to grasp onto, but after time it would get easier. Hey Steve, We have a very successful ecommerce site and have been contacted by Amazon to start selling on their platform. We have our own brand and I am VERY nervous because we are in a competitive market and I am reading a lot online about other sellers creating cheap knockoffs of brands on Amazon. We have worked so hard to build our brand and I am afraid selling on Amazon will create clones selling cheap duplicates made in China. Any experience with this? If so, are there any steps to take to report other Amazon sellers selling the knockoffs? Can we get the Amazon google listing removed?